Chanting the Durga Suktam will definitely bring you to explosive experiences. 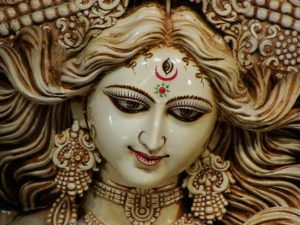 Even if you have never experienced the immense power and grace of Shakti despite trying, chanting this Durga Suktam, again and again, will accomplish you everything in life. 5.2: May that Agni (Fire of Durga) carry us over this World full of Great Difficulties, by (charging ahead and) Burning to ashes the very difficult Enemies (within us) with Her Divine Fire. All images, designs or videos on this page are copyright of their respective owners. We don’t own have these images/designs/videos. We collect them from search engine and other sources to be used as ideas for you. No copyright infringement is intended. If you have reason to believe that one of our content is violating your copyrights, please do not take any legal action as we are trying to spread the knowledge. You can contact us directly to be credited or have the item removed from the site.